When setting up a new PC or workstation, you might be tempted to just set it on, or under, the desk where it is going to be used. While this is certainly the most common option, it likely isn’t the best. For companies that have a data center or computer closet, using the server racks to house PCs can be a great option. There are shelves and rail kits available that can be added to most standard server racks to make mounting the PCs easy. You can run monitor, keyboard, and mouse cables either under the floor, through the ceiling, or behind the walls. With smaller server racks, you can even have them mounted near the place where the PCs will be used, for easier access. Keeping normal workstation PCs in server racks provides some very significant advantages that many people overlook. While this strategy may not be right for every situation, looking at the many reasons why a person would install their PCs into a server rack using shelves is well worth the effort. The first and most obvious advantage to using server racks to store PCs is that the hardware will be protected. When a PC is just sitting on or under a desk, it is at risk of getting knocked over, have water or other liquids spilled on it, and get damaged in other ways. In a server rack, on the other hand, it is kept securely in place at all times. If someone needs to access the PC for some reason, they will have to intentionally open the rack to work on it. This minimized the risk of accidental damage to computer equipment. Of course, it also helps to keep people who aren’t approved IT professionals from attempting to work on the PCs without authorization. Server racks are designed to facilitate proper air flow, which keeps the equipment within nice and cool. When a PC is being kept at a normal desk, on the other hand, the fans can be pushed against cube walls or otherwise blocked. This can severely reduce the cooling capacity of the PC, causing it not to function properly over time. If your server racks are kept in a data center or other similar area, the entire environment will be kept at a safe temperature for the PCs to run safely and efficiently. Computers on desks often become a source for a lot of disorganization. All the cords that are needed can get tangled or just spread out over the desk. Even when the computer is under the desk, the cables can get damaged by being kicked or stepped on. When the PC is kept in the server rack, all the cabling will be kept much more organized. Only a few cables (keyboard, mouse, video) will even need to be run to the individual desks, and that can be done in a much more intentional and organized way. Keeping multiple PCs in one server rack with shelves can make it easier to provide them with more consistent power. 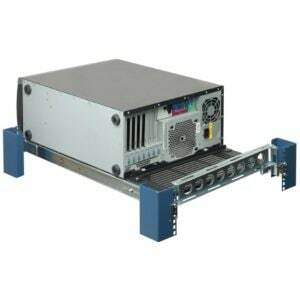 Many server racks have power run through large redundant power supplies, which will prevent the equipment from going down, even if the main power fails. 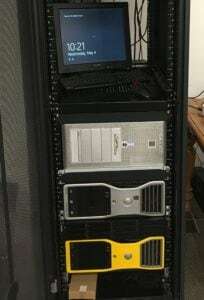 It is also possible to use one smaller uninterrupted power supply (UPS) placed in the rack to provide localized redundancy for key computers. Another power related advantage is that you can have all your PCs running through the right electrical circuits. This makes it easier to be able to do other power work in your facility without causing outages for your actual PCs. Unplanned power outages can cause serious problems for PCs, so keeping everything centralized is a big help. Finally, server racks with shelves will provide for a much cleaner environment. As most people know, dust can cause a lot of issues within a PC. By housing the PCs in the server racks, you will have an extra barrier of protection against this type of contaminant from getting inside the computers and causing problems. For even more protection, there are add-on filters for many types of server racks that can help keep the area even cleaner. 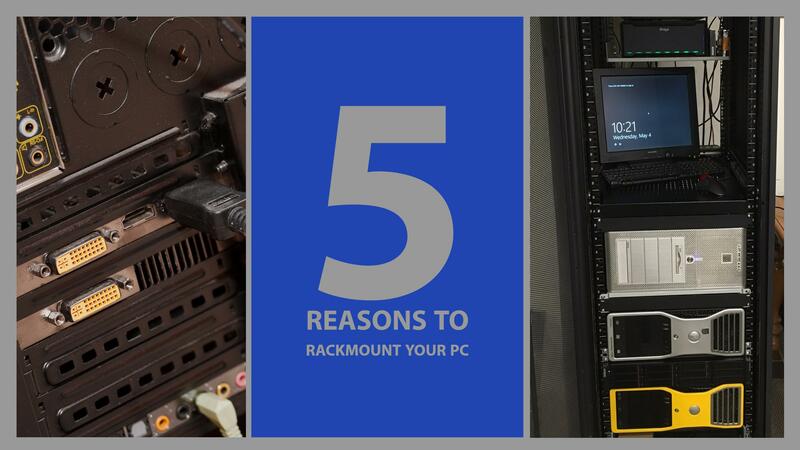 As you can see, there are many important reasons why a person would want to install their PCs into a server rack using shelves. If this is something you would want to consider for your home or business, take some time to look through the different types of racks to see which ones will work best in your environment. Using a rack mounted shelves and rail kits can make installing a workstation PC to a server rack a quick an easy solution to organize your workspace.